← Holy crap, I LOOOOOOVE lamb!! Again, I’ve been TERRIBLE at this blog stuff lately!! I can say, however, I have a really good excuse! This summer was a summer of change…in more ways than one. All for the better, but a lot at once. I quit my job in LA and took a new gig in San Francisco. So that meant moving. What a lot to keep track of! I had so many lists! Organize, pack, apartment hunt, celebrate, pack some more, celebrate some more, take in all LA has to offer before moving to the foggy city… like the farmers markets, then celebrate some more. I’m sure SF has some great farmers markets, but even tho I was moving I still had to stock up on the amazing veggies that were arriving. 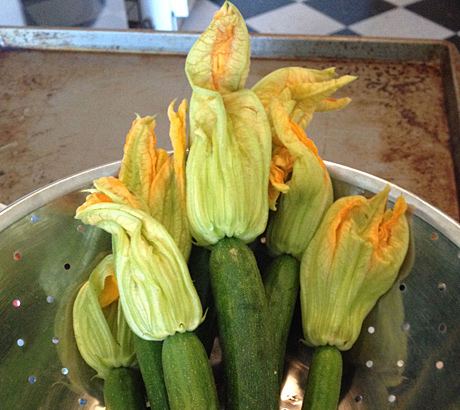 So pretty and so ready to have something stuffed into the blossom and fried! What to stuff them with was the question. 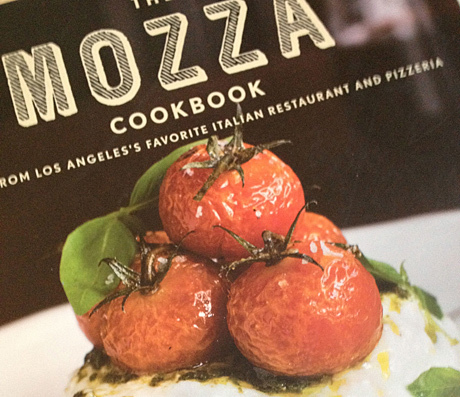 Every recipe called for ricotta cheese which isn’t my total favorite. 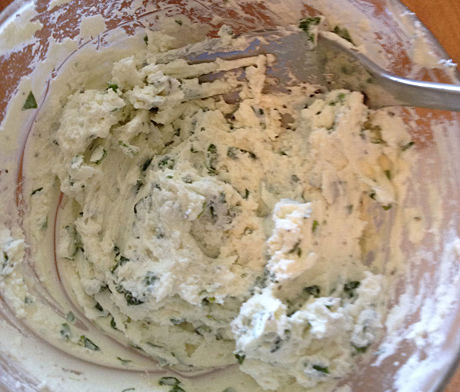 I looked in my fridge and had a log of feta, some fresh basil, thyme and chives. Figured that some herbed feta would work just as well. Chopped up the herbs and added a little S&P. 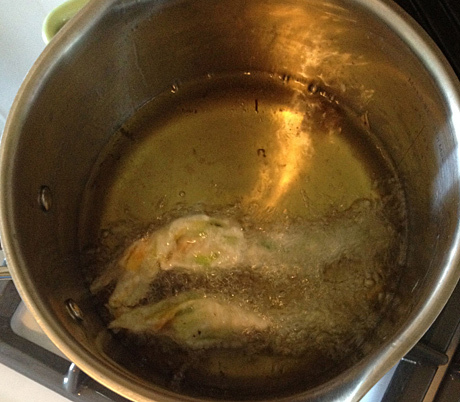 So once you pinch out the stamen and mix up your stuffing you’re ready to rock. I sort of took the best of a few recipes for a simple beer batter for the frying part and loosely followed the Mozza technique. I love Nancy and team and all that they do. If I am looking for inspiration and wondering what to cook I pull out one of her books or look her up online for ideas. OR just head over to Osteria Mozza and grab a seat at the bar. At least I used to be able to do that before I moved 😦 I couldn’t take a picture because my hands were covered in batter, but after you dredge them through the batter you drop them into your vat of boiling oil (which happens to be my biggest fear of ways to die -in a vat of boiling oil – super realistic! but I digress) I kept an eye on them until they looked a bit golden. About 3 minutes. I love that these had the little squash still attached. Made for a delish appetizer to eat with you fingers. As complicated as they ‘sound’ they’re really not. A bit messy but totally worth it. Now I just have to wait another 11 months for them to come back. In the meantime I’ll hunt around my new hood for fun markets, specialty grocery stores and new foods inspired by SF to cook and blog about. 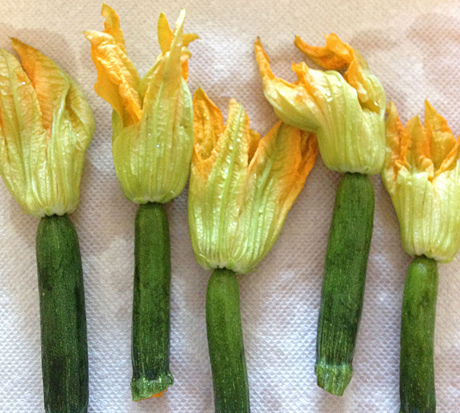 This entry was posted in cooking, Uncategorized, vegetables and tagged basil thyme, farmers markets, food, restaurants, squash blossoms. Bookmark the permalink. 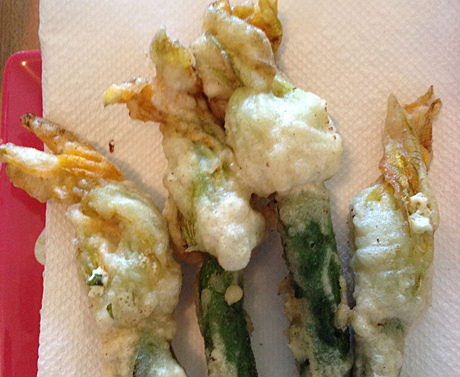 1 Response to Squash Blossoms… stuff’em!